You probably also know that Nature is my Other Mother. So I wasn’t too surprised when, after Mom’s celebration of life, I came home to find friends greeting me as I swam in my lake. Two grand birds soaring high—eagles or vultures? Either would be symbolic, as both eat carrion, turning the dead into new energy. 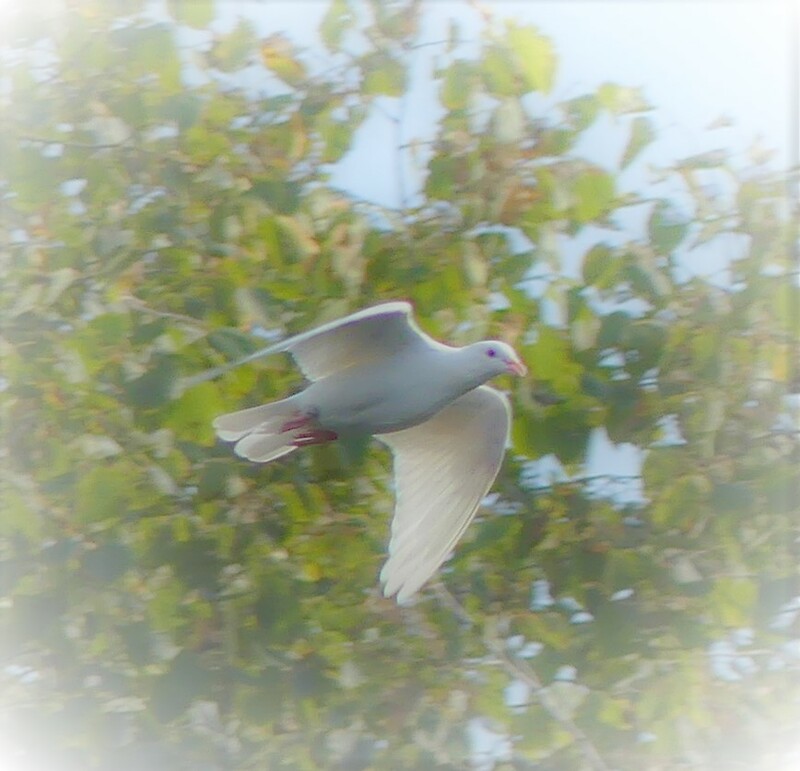 A white dove, just like the one we released ten years ago at Dad’s celebration, circled over me. Dad? Is that you? Or Mom, going to join Dad? Or (smile) just one of the many white doves my neighbors John and Marsha released at another event that day, returning home to roost? Whatever it was, it made me cry happy tears. The contrail of a jet shone brilliantly as it shot upward toward the sun. That had to be Dad, the lifelong aviator, ecstatically welcoming Mom! Then swallows, catching the sun on their golden breasts as they swooped, and a perfect row of 16 geese flying over with that wonderful sound of swishing wings. But the best, as I reached the middle of our little lake, was a beautiful great blue heron that dipped gracefully over me. Was that B saying Mom’s there with him and Dad now? (See “The Gifts of the Great Blue Heron and the Great Blues Man.”) No matter the source, each was a generous blessing. Then who shows up but the goose family that had been visiting me daily. So I called to them, and they followed me to the dock for a little picnic of corn. It was the perfect closing to the long vigil with Mom and the busy preparation and day of her celebration. I finally relaxed. 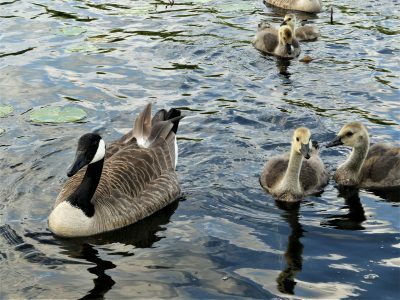 It was a week later when Father Goose showed up with one of his wing feathers askew, time to molt and grow new ones for the migration. So I told him it would be nice if he dropped it here for me, but I felt silly, knowing that was pretty unlikely, since they traveled a wide range over this lake and the next. Even if he dropped it here, it would surely drift away or into the cattails. Oh, well. But I did take a good look at it, just in case. The next day I went down to the dock for my swim late, not thinking about the geese or feather. 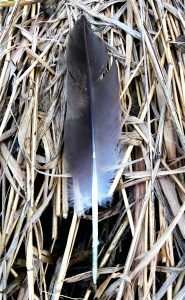 But as I walked by the loon nesting platform (waiting to be anchored further out) I couldn’t help but notice a feather. The feather. Looking not at all dropped, but as if it had been carefully, artfully, deliberately placed so that I’d know Mom put it there. 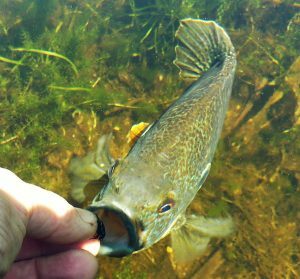 Astonished, I imagined her smiling as I kissed it, then dove in for my swim. It’s been over two months since that extraordinary day. The feather still lies on my table, but the geese are gone. Their strong new feathers carried them into the sky, where they joined other families preparing to migrate. I miss them, as I miss Mom. 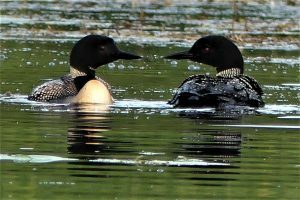 But then a pair of loons came, one with a rare golden breast. They flirted, danced, and hooted for hours while I took their pictures. 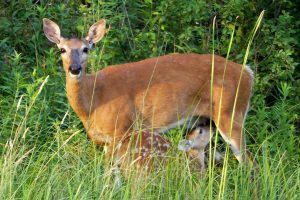 A doe stood on the shore, nursing her fawn, and soothing my heart, as I watched from my canoe. My friendly sunfish Greenie finally left the nest he’d been cleaning and guarding for so long. I hope he avoids the hooks and returns for a third summer with me. But now I have a new green friend—a tree frog. 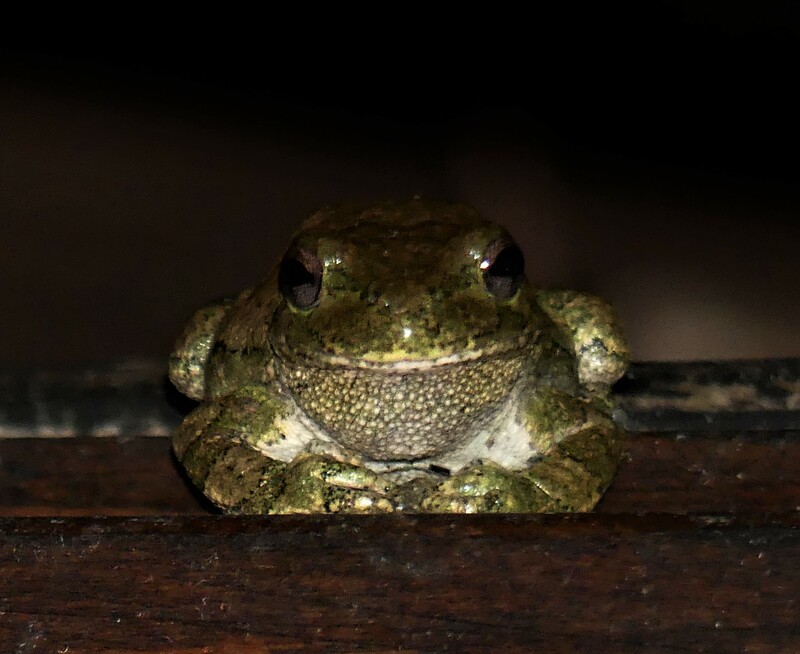 He sits on my kitchen window every night, as calm as a little Buddha, even with the clatter of dishes and my chattering to him. I asked my friend Susan to talk about this, since she has a gift for seeing the mystical. She told me about Alice, an old woman she grew close to while working in a nursing home. Alice had a potty mouth but a sweet heart. On her deathbed, her eyes grew wide and she softly said “I am the wind, the sun, and the flower!” Susan, amazed, asked her, “Are you becoming one with the universe?” Alice gently nodded—yes. Simply splendid, holy & wonderful. Oh, my!! Holly, your words are as beautiful as your heart. You are an amazing lady. Thank you so much, Claudia. You are, too! Thank you, Rubin, for your very kind words. I’m glad it touched you as it touched me. 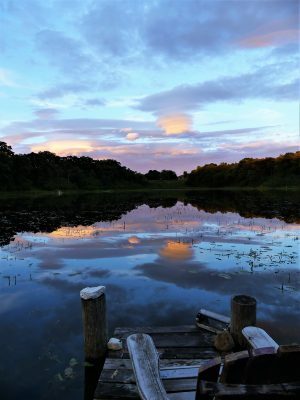 How fortunate I feel to have visited the magical place on the little lake you call home. 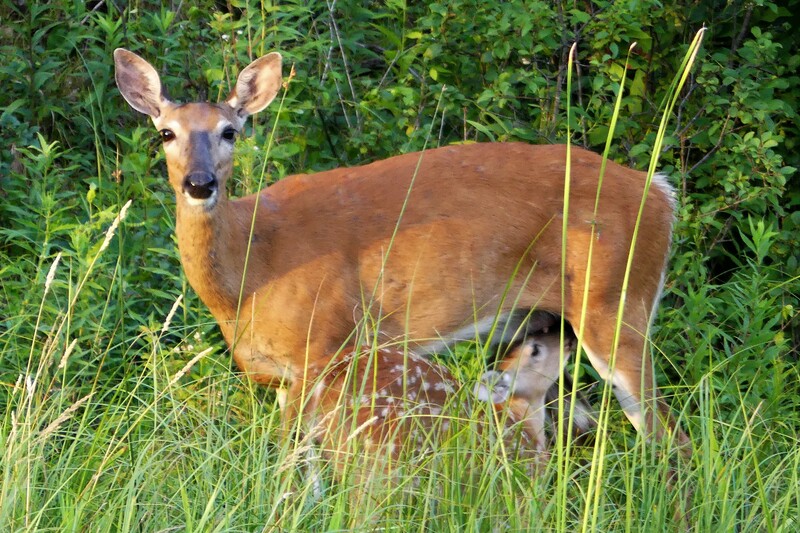 You showed me where the doe and fawn come to feel safe. I’ve seen where all the other creatures come to meet the woman of which they have heard. It is quite extraordinary and it is small wonder to me that so many little miracles happen there. It seems to be a very rare terminal where souls come and go from this world to the next and life forms morph through the power that radiates from within the walls with the bottle-glass windows. Is it a permanent terminal to the Universe or a finite one? Who can say. All I know is that the station master has much to do with it. Thank you for your special words, Steve. I’m glad you were able to come here, too, and hope you come again some time. You were a major inspiration in my journey into photography, and that has allowed and encouraged me to share my love of nature on a whole new level. We will be showing your beautiful pictures of the wildlife on Long Lake to those thinking of buying Mom’s house. This was beautiful Holly , I love the way you express your thoughts and musings on nature. I do believe this was your mother, I asked for a sign from my mother and got one. We are all energy sparking in and out of reality. Thanks and love to you, Susan, for your kind words, but especially for sharing your extraordinary story of Alice and her final words. My story wouldn’t be the same without that ending. I returned last week from the Main Salmon River, after camping, rafting for 6 days and spending time in a small town, detached from radios, stores, cars… till the airplane lifted me out of Idaho and deposited me back in this midst of suburban life. I feel the contrast every day and never want to be more connected to the churn of life that pinches out the natural connection to life itself. Thanks for another testimonial of how perspective can shift from all to nothing. This “normal life” hijacks itself. Love to you Holly flower! How wonderful, Linda, that you had that wonderful respite in Idaho! Keep those memories and that peace inside and keep watching for bits of it hidden in the city. Love back to you, Linda, and see you soon! Holly, There is so much out there speaking to us. It takes special openness and awakening to be aware of it. Thank you for your sensitivity to seeing what is there and reminding us of being open to all that life has to tell us! Thank you, Jan, for your special openness and sensitivity, to both nature and people. We are overdue for a walk in the woods together. Maybe the river again? Here is hoping your Mom will be with you in all of these ways as you walk your path. I am certain she will, because you know how to see and hear what she will have to show you and say to you. You are now your mother’s eyes and ears in this world. She could not have passed them on to a more worthy recipient. Thank you, Eric, for your kind words. They encourage me to get outside. It’s always a tug of war between that and this computer – reading, writing, and photo work. These are my way of sharing, but without going outside, there would be little to share. I loved your story about your mom. Of course she sent you that feather. My mother passed 24 years ago but I still think of her every day of my life. We were so lucky to have mothers who were worth missing. Hope to see you soon at Pen Pals. Thanks,Lin. Yes, we were, and are lucky. See you on the 3rd.